For two years I was a member and one of the leaders of a Quake TeamFortress internet Clan. -As a work for the Antropology class: Quake TeamFortress: Aproximação a uma comunidade virtual, June 1998, 74 pgs. and VHS tapes, with Professor Dr. J.A. Fernandes Dias. 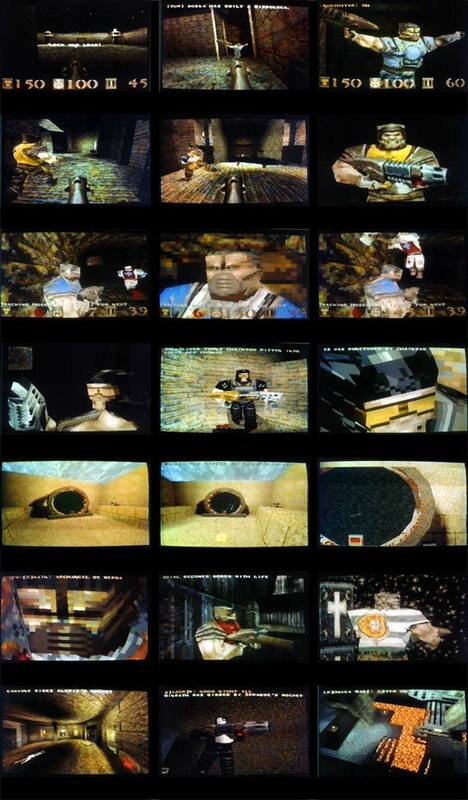 Barney Online is the record of a series of virtual performances of my character, 5Q.Barney, in the world of the internet game Quake TeamFortress. After one year as Barney, I became first a member (by invitation), then 1st. advisor, and later, one of the 5 leaders of the largest and oldest active Quake clan in Portugal at the time: the 5Q Clan, that reached 32 members (5Q stands for 5 Quinas, as symbol of a good defense, present as well in the portuguese flag). The global Quake community meets everyday in thousands of different locations (servers) where they chat, interact and kill each other. Most of this comunity joins clans of 10 to 40 members. Admission into a clan is very difficult -requiring skill, morality and an understanding of each clan’s hierarchy and rules. Lastly, approval from the clan leader, founders or council is necessary. Matches between clans often include thorough preparation of attack and defense tactics. Skins (the character’s physical appearance) and maps are built by the community and sent to the servers, becoming available to everyone. Quake TeamFortress is extremely violent, yet establishes friendships amongst its participants.